What do President Obama’s Higher Ed Proposals mean for Christian Colleges? President Obama spoke Thursday at SUNY Binghamton to introduce his ideas about higher education in America. Friday he elaborated on those remarks at Lackawanna College in Pennsylvania. Binghamton is a research one university with just over 15,000 students. Lackawanna is a two-year (community) college with 1500 students and a focus on vocational training. From the itinerary, it seems clear that the president doesn’t have a “one size fits all” view of higher education. There’s a reason that he’s focusing on very different higher ed sectors. His remarks on Friday included passing references to the for-profit sector and to law schools. I followed some of the initial reporting on Friday about the Binghamton speech. The president suggested clearer measures on college completion, tuition escalation, and lifetime earnings. The hope is that families being aware of “value for the dollar” will pick those institutions that hold costs down while achieving high outcomes, creating a competitive environment where the incentives shift from “what the market will bear” to “demonstrating quality“. He also gave a shout-out to innovations in technology (flipped classrooms, MOOCs) and competency-based education or credit for life learning. I didn’t get too excited about the president’s comments because it’s very early in the idea phase much less the implementation phase. It’s only today that I’m reading responses to Friday’s speech. That didn’t stop organizations from issuing their immediate disclaimers calling out the normal suspects. For example, the AAUP came out with this statement on Saturday. They raise the normal concerns about shifting state revenue, No Child Left Behind, and the financial impact of federal compliance. Actually, much of their critique was a response to articles in the Wall Street Journal from December. They critique highly paid administrators and raise questions about how a focus on graduation rates will disproportionately impact students who are lower class or people of color. Two weeks ago, Council of Independent Colleges president Richard Ekman wrote an open letter to President Obama about public pronouncements on college costs. Ekman rightly observes that most of the attention in the media and in Washington has gone to elite private schools and the escalating public institution tuition increases (on a percentage basis) due to decreased state funding. He points out that the private college sector is playing a vital role in both access and affordability. While the top 100 colleges enroll 17 percent of their students from low-income backgrounds, smaller, private, nondoctoral colleges and universities, despite smaller endowments and less selective admissions, enroll approximately one-third of their students from low-income backgrounds. If I put all this together, we have many sectors of higher education under consideration. Large public research universities, community colleges, for-profit, elite private, small residential private, and within that sector, the Christian college or university. There is no way a single policy initiative can cover that breadth. That’s why accrediting institutions begin with institutional mission and then ask the school to evaluate its success against its unique mission. This morning I read a wonderful post by Matt Reed in Inside Higher Education. Matt, a community college administrator in Massachusetts, usually has excellent insights on major trends in higher ed (and child-rearing). Today he focused on a geeky report from the Brookings Institution. The report, by Beth Akers and Matthew Chingos, made great use of regression statistics. They used inputs (SAT, ACT, and student body characteristics) for major universities to predict an expected six year graduation rate for 15 major universities. Then they compared the actual six year rate to the predicted. 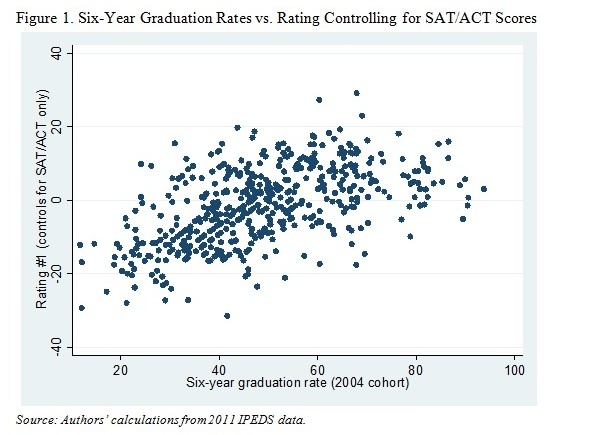 As the following chart shows when you control for inputs, the relationship between institutional ranking and graduate rates seems to go away. They go on to argue that one could control for inputs more carefully and see if schools outperform their estimates. They contrast the University of Michigan (which slightly underperforms when inputs are controlled) with MSU (which overperforms). Not trying to start any in-state fights here in Michigan — it’s just what the data suggests. Reed suggests “Deploying a squadron of sociologists to improve public higher education in America strikes me as public money well spent.” Naturally, I think this is a FABULOUS idea! But he does suggest an approach to understanding quality outcomes within a given sector that could work. In addition to considering input data (Ekman observed that private schools disproportionately draw from lower income, first generation populations), we also need to consider the kinds of jobs that our graduates pursue. One would also need to do regressions on differential percentages of graduates heading into fields like ministry, social work, education, engineering, computer science, and finance. When career aspiration is controlled in the same way as input data, you’d have a better measure of institutional effectiveness that wouldn’t favor only some privileged sectors. One more thing. You could even factor in contact measures like average class size or student faculty ratio as a means of controlling for the educational philosophy that drives institutional choice (for both the college and for students deciding to attend there). We’d then be able to compare Spring Arbor to the University of Michigan by statistically controlling for the various correlates of success. Multiple Regression is a Wonderful Thing! I think the Sociology Squadron needs a good name. Any suggestions? a) Back about 1990 or so, Alexander Astin proposed, in a conference paper later published, I think, that the predicted graduation rates for colleges and universities could be determined on the basis of SAT/ACT scores, high school grades. This was based on the HERI observations of students who entered college and graduated four years later. He indicated that other factors contributed, and could be factored in, but that the primary factors were standardized test scores and high school grades. The new research adds more factors, but doesn’t necessarily tell us what the weight of each of those might be. I’m not complaining about old data or old methodology, just that this is not exactly innovative. b) What Astin suggested in the paper, then, was that an institution that had higher graduation rates for students with similar initial qualities was likely doing something better than institutions that were “under-performing.” What that “something” might be has, I think, been very challenging to tease out–these days, improving student persistence may not be so much about the right intellectual atmosphere or support as providing appropriate financial aid, for instance. c) The most vituperative comments on the Obama proposal–apart from the nut jobs who want to “put the white back in the White House”–seem to fall into several camps. There are those who see this as another No Child Left Behind set of inept coercive measures against higher education; there are some violently opposed to private education for its supposed elitism, and who believe that public education must be the beneficiary of the Obama plans; there are some who believe that the kind of accountability the announced ideas entail must fall on the administration and the states, not the faculty. d) Most of the really violent comments appear to come from observers who have experienced a fairly narrow sector of higher education. I think that some of the Obama comments, in fact, also reflect a narrow understanding of higher education, and clearly, the Department of Education itself appears staffed with those who believe that “control” through legislation and rule-making is their primary task. e) Finally, I have grave doubts about whether the President or many in the administration have an accurate understanding of Christian higher education, because their own faith perspectives do not actually involve commitment to a set of doctrines that differentiates them in any unique way from liberal social values. President Obama, as an example, does not appear to recognize that Christian believers might disagree strenuously with him on issues of the sanctity of life, or on what biblical values might say about Christian marriage, or on what limits are on the state regarding Christian conscience. It is very easy to believe that members of the administration are publicly committed to Christian social values because they align with liberal political values, rather than the reverse. If this is the case, then evangelical Christian higher education, which bases its work in the task of enabling students to become disciples–intellectually acute, emotionally and socially mature, full of compassion, but also “virtuous” in old-fashioned ways–is not likely to thrive. Thanks, Rich. I always appreciate your reflections. I agree that what the Brookings people have done isn’t especially new, but it’s timely to remind people that too much of higher education conversations focus on inputs. If all we’re going to do is measure graduation rates and inflationary costs, then the solution is to focus on upper class students with high SAT scores. But that’s not the transformative mission of colleges like our two schools. Second, there need to be better measures for overperforming or underperforming than just jobs and graduation rates. I love the AAC&U stuff because they push us to an informed citizenry who can think carefully in new situations and explain themselves to others. Small liberal arts college excel at that. I agree that there is a myopia among policy analysts. Years ago when in the Northwest, I heard a DOE official explain that transfer policy was going to be a big deal in the coming HEA reauthorization because every hill staffer had a horror story of how they were badly treated in some elite institution who wouldn’t recognize their prior work. I think that generalizes so that people think that the Harvards and Berkeley’s ARE higher education, which is the point Ekman was making. We’ll have to disagree on the last point. I think a new era is upon evangelical higher education, providing we develop the ability to speak to the broader culture from the depth of our positive values and not solely from our opposition to that culture. I’m drawing from a number of younger evangelicals who are thinking is less separatist ways. It’s possible that they’re outliers but I’m hopeful that they’re doing the thinking we need to hear.